by Ryn McCoy on November 28, 2018 » Add the first comment. Young Audiences of Oregon & SW Washington is thrilled to announce the expansion of its arts education services in Central Oregon. 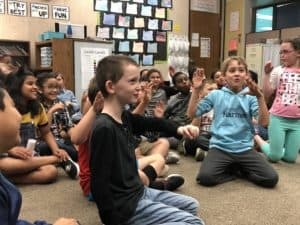 The nonprofit organization will begin its service expansion this school year by bringing Central Oregon artists into underserved classrooms in La Pine, Bend and Madras to engage students in filmmaking, nature journaling and more. Young Audiences of Oregon & SW Washington — which is celebrating its 60th anniversary and is the local affiliate of the nation’s largest arts-in-education network — has received funding from the Maybelle Clark Macdonald Fund and the Young Audiences national office to offer these in-school residencies in Central Oregon, as well as professional development for local teaching artists. Central Oregon has amazing artists, teachers and community organizations and we are delighted to collaborate with them all. These services will be part of a pilot program that aims to provide sustainable, long-term arts programming in Central Oregon schools. “The arts have the power to change lives. Young people in Central Oregon deserve rich opportunities to learn through the arts, which research has proven is linked to all manner of positive outcomes, from higher graduation rates to improved academic performance,” says Cary Clarke, Executive Director of Young Audiences of Oregon & SW Washington. Students participate in a Young Audiences residency. Residencies that will be taught by local artists for the 2018–2019 pilot school year include Future Filmworks’ film-making with Brent Barnett at Bear Creek Elementary, nature journaling with Rachel Lee-Carman at La Pine Elementary, and poetry and visual art with MOsley WOtta at Madras High School. MOsley WOtta (aka Jason Graham) will be working with freshman biology students, writing poems that use metaphor to describe the functions of human cell structures. They will then create a mural with original poetry and artwork that will be hung in the school’s science and technology wing. Over the past two years, following the 2016 closure of Bend-based organization Arts Central, staff at Young Audiences have held conversations with Central Oregon’s arts organizations to inquire how the Portland-based nonprofit could best support, supplement and partner with existing arts education programs in the area to increase opportunities for young people and artists. 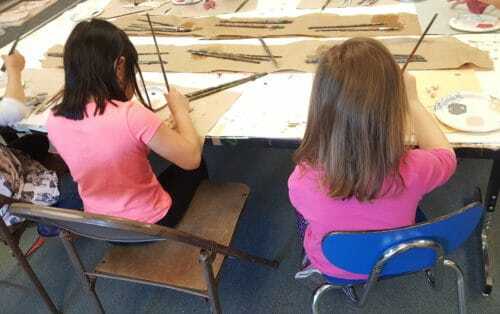 “Bend Art Center is thrilled to partner with Young Audiences and offer professional support to art teachers in our region,” says Dawn Boone, Education Manager at Bend Art Center. It is one of my passions to support artists who teach, as sometimes it can seem like a profession without much support or scaffolding. Spearheading the coordination of Young Audiences’ Central Oregon service expansion is Jamie Shanahan, who has worked for Oregon education and arts organizations for ten years. She is a poet, essayist, musician, teaching artist and non-profit administrator, who has taught extensively in schools for organizations such as The Nature of Words, Literary Arts, and Young Audiences, as well as coordinating programs for The Right Brain Initiative, High Desert Journal, and Volcanic Theatre Pub. She is based in Three Rivers South, and is working alongside other arts organizations to provide more arts opportunities for the region’s students, serving on staff at Young Audiences as the Central Oregon Program Coordinator. The Young Audiences Central Oregon pilot will also provide paid Teaching Artist Studio workshops for the region’s teaching artists. 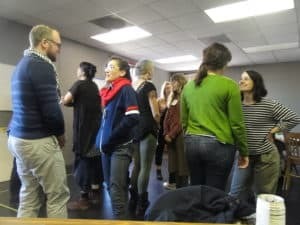 The Young Audiences Teaching Artist Studio is a nationally acclaimed professional development program for teaching artists in Oregon and SW Washington. Teaching artists participate in a Teaching Artist Studio workshop. Young Audiences staff will lead Central Oregon artists through workshops examining how to structure arts teaching to effectively engage and support students and collaborate with classroom teachers. The workshops will be hosted at Bend Art Center in late November. Teachers, administrators and families in Central Oregon interested in bringing arts education programming to their schools are invited to contact Young Audiences. One way schools can get involved is to hold a Young Audiences Run for the Arts fundraiser in the spring or next fall. Over 20,000 students across the region participate in this jog-a-thon fundraiser every year to raise money for arts education in their schools. To learn more about Young Audiences Run for the Arts or Teaching Artist Studio in Central Oregon, please email Central Oregon Program Coordinator Jamie Shanahan at jamie@ya-or.org. For more information about Young Audiences, contact Ryn McCoy at youngaudiences@ya-or.org.